The Parker Solar Probe as seen on July 16, 2018, waiting to launch aboard a United Launch Alliance Delta IV Heavy rocket. 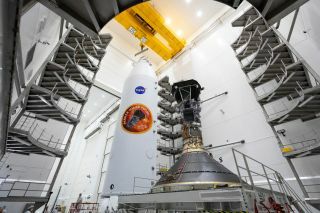 NASA's Parker Solar Probe — the space agency's new spacecraft designed to "touch the sun" — is packed up, buckled in and ready to launch during a window opening Saturday (Aug. 11) at 3:33 a.m. EDT (0733 GMT) from NASA's Kennedy Space Center (KSC) in Florida, according to a NASA news conference today (Aug. 9). The weather is the team's only lingering concern, agency staff said. Right now, there's a 70-percent chance that the weather will cooperate for a Saturday morning launch, Air Force weather officer Kathy Rice said during the news conference. Saturday's launch window will remain open for about 65 minutes, Omar Baez, launch director at KSC, said during the news conference. If the launch were to occur after that time, he and his colleagues are concerned that the spacecraft could potentially be damaged while flying through the Van Allen radiation belts that surround Earth. A launch rehearsal conducted yesterday (Aug. 8) went smoothly, Baez said, and he will receive a final weather briefing tomorrow (Aug. 10) at about 10 p.m. EDT (0200 GMT on Aug. 11) to determine whether to fuel up the rocket in hopes of targeting Saturday morning's launch window. An additional window opens Sunday (Aug. 12) at 3:29 a.m. EDT (0729 GMT), Baez added, with daily windows until Aug. 23. As of today, the chances of weather impeding a launch are 40 percent for Sunday and 20 percent for Monday, Rice said. The $1.5 billion Parker Solar Probe will be the first NASA science mission to launch aboard one of United Launch Alliance's (ULA) Delta IV Heavy rockets, and Saturday's launch will be the 10th launch using that type of rocket, according to Scott Messer, NASA's program manager for ULA launches. "This thing goes like nothing has ever gone before," Messer said of the massive rocket, the second most powerful after SpaceX's new Falcon Heavy. In addition to the two-stage Delta IV Heavy, the Parker Solar Probe will be buoyed by a third stage built by Northrop Grumman that will fire about 37 minutes after the initial launch. Combined, the three stages will ensure the spacecraft can gather the immense speed necessary to successfully orbit the sun. Assuming all goes well on Saturday, the spacecraft will make its first close pass above the sun in November.